Verdict: 40 years confinement at hard labor/ Reviewer reduced to 33 years due to findings relative to Specifications 1 and 6. Reviewing Authority's Recommendations: 1. Manual states that "prisoners have a right to inform the military authorities in whose power they are, of their requests with regard to the conditions of captivity to which they are subjected. Article 42, Title III TM 37-251. It would logically follow that the belligerent nation has a duty to provide interpretation when such is available. To fail to do so would be a violation of the obvious intent of the Article...The specification, however, is faulty in that the accused is charged therein with failing in his duties as an interpreter, among which is an alleged neglect of duty in not adequately investigation complaints of the prisoners. It seems logically obvious that the duty of the interpreter...does not embrace the investigation of complaints." There fore, accused is guilty of only a part of specification 6. 2. Since the court found the defendent guilty of an offense occurring 5 months before the time charged is prejudicial to the accused due to the discrepancy between the two affidavits given to the defense before the trial. It "no doubt misled" the defense. Therefore, accused is not guilty of specification 1. 3. In terms of petitions for clemency, the reviewer writes that, "A general yardstick for evaluating sentences in war crimes cases would be ina ppropriate because of the varied conditions and circumstances under which the offenses in different war crimes cases were committed. The accused lived in America and attended school there. He was aware of the humanitarian ideas of Americans. The commission may have taken this into consideration in arriving at a setence and may have thought it an aggravation of the offenses." Defense Arguments: 1. 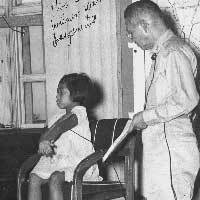 Superior orders - Superior of the POW camp had issued a rule which prohibited POWs from talking to koreans or other Japanese civilians. Also, superintendent of mine stated that he ordered a similar rule and that the rules were known and posted everywhere. 2. Accused was never seen to be beating prisoners. 3. Accused was known to treat prisoners too well. 4. Accused said that he sometimes slapped prisoners for misdeeds in front of guards because he believed that would prevent them from being beaten with clubs. 5. Denied many of the abuses of specific individuals and denied everything but slapping prisoners. 6. Tried to make life a little easier for the prisoners. Judge Advocate's Recommendations: 1. Is this the first time that someone who is prosecuted for violations of the crimes of war for "refusing to discharge his duties" as interpreter by refusing to interpret? 2. Cross-reference this with the trials of Isao Fukuhara.